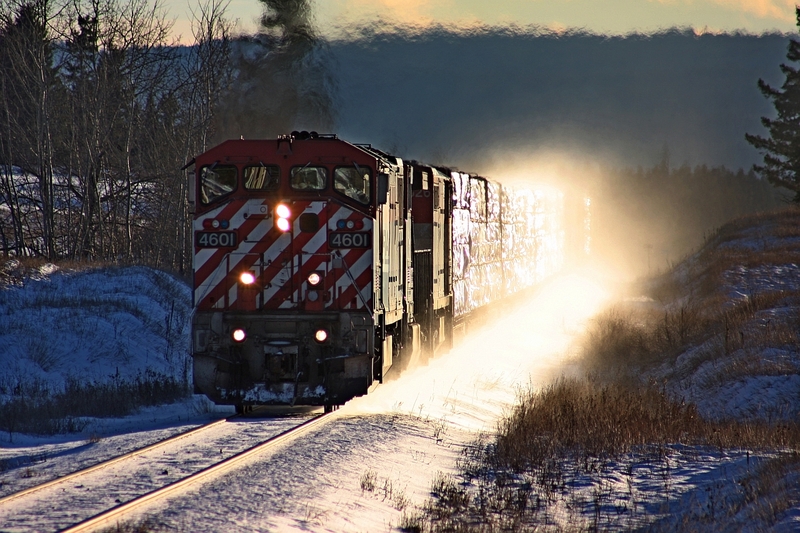 Railpictures.ca - Dale Miller, collection of Doug Lawson Photo: A photo from Dale Miller taken on a bright and cold winter afternoon. Dale had been for a visit with me in Williams Lake during a highway trip north and chased our train along the way. Anytime Dale was out and about chasing trains, BCOL 4601 always seemed to be in the area. Seen here at mile 357 on the BC Rail Prince George subdivision my three unit consist has just crested 4 miles of ascending grade including a nasty one point five percent one mile segment. We were really bogged down and eventually discovered that the second unit had returned to idle with some computer fault and no alarm indication on the lead unit. | Railpictures.ca – Canadian Railway Photography – photographie ferroviaire Canadienne. Copyright Notice: This image ©Dale Miller, collection of Doug Lawson all rights reserved. Caption: A photo from Dale Miller taken on a bright and cold winter afternoon. Dale had been for a visit with me in Williams Lake during a highway trip north and chased our train along the way. Anytime Dale was out and about chasing trains, BCOL 4601 always seemed to be in the area. Seen here at mile 357 on the BC Rail Prince George subdivision my three unit consist has just crested 4 miles of ascending grade including a nasty one point five percent one mile segment. We were really bogged down and eventually discovered that the second unit had returned to idle with some computer fault and no alarm indication on the lead unit.